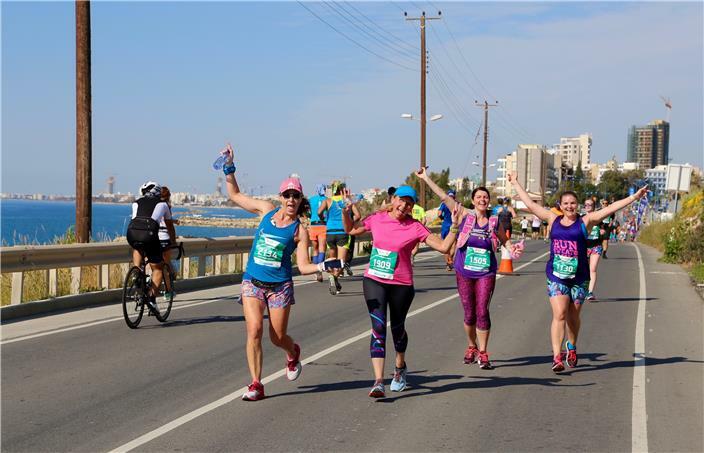 OPAP Limassol Marathon GSO is one of Europe’s most recognisable sporting events, boasting a spectacular race setting, flat and fast course, beautiful spring weather, professional organisation and first-class hospitality. It has become a key date in the spring race diary and this year’s event welcomed the largest number yet of runners from abroad, including over 500 British runners and 2,000 overseas runners. The 13th edition of OPAP Limassol Marathon GSO took place this weekend, Saturday 23rd and Sunday 24th March 2019, and saw thousands of runners from all over the world take on six different races and enjoy a superb weekend of running. Saturday 23rd March began with the highly anticipated PrimeTel Corporate 5K Race, where 228 teams competed against each other for the title of the fastest team. The title was claimed by Garmin Cyprus with an average time of 16:44, followed by Orbit Moving & Storage (18:13) and University of Cyprus (18:57). Christoforos Protopapas (Garmin Cyprus) was the fastest male with a finish time of 15:44, and British runner Jordan Foster (UKRunChat) was the fastest female in overall 10th place after finishing in 17:51. The PrimeTel Corporate 5K Race was followed by Andrey and Julia Dashin’s Foundation Youth Race, a much-loved event that gave young runners aged 6-16 the chance to get involved in this big weekend of sport. The atmosphere was also buzzing at the Petrolina Energy Day and the Mitsides Pasta Party, setting the scene for the big four races on day two. Sunday 24th March started promptly with the AIMS-accredited OPAP Limassol Marathon GSO setting off from the seafront at Molos at 7.30am. For the first time this year, there was live streaming of the day’s action on YouTube and AlfaSport.TV featuring commentary from endurance runner Susie Chan and Erodotos Miltiadous, with live results and interviews. With the Mediterranean glistening in the early morning sunshine, the marathon runners headed off on the flat and fast course past the marina and port, before turning around to follow the coast as far as the ancient ruins of the Royal City of Amathus. With a maximum altitude of 18m and breathtaking views out to sea, the course proved to be a perfect location to run a strong race, with lots of PBs and scenes of celebration as competitors crossed the finish line back at Molos. The 2019 OPAP Limassol Marathon GSO was dominated by Abel Kibet Rop from Kenya who claimed the title with a twenty minute gap in a time of 2:17:40. Fellow Kenyan runner Ruth Chemisto Matebo secured the women’s title in 2:43:30. Limassol Half Marathon, which had sold out for the first time, set off shortly after the marathon at 7.40am. Hilary Kiptum Maiyo Kimaiyo from Kenya secured the top spot on the podium after crossing the finish line in 1:07:19, and the female title went to Christine Moraa Oigo, also from Kenya, with a finish time of 1:15:37. The Petrolina 10K Energy Race was the third race of the morning, with the top spots on the podium claimed by Cypriot athletes Avraamis Avraam (34:51) and Olga Andrejeva (37:39). The 5K City Race was the last race to get underway, and it was won by Stelios Papaioannou in 16:34 and Louiza Tsianakka (Dromea Racing), both from Cyprus. British runners claimed a number of age category first places, including 1984 Olympic silver medallist, Wendy Sly (Limassol Half Marathon F60, 1:46:59), Bashir Hussain (5K City Race M50, 19:30), Jackie Newton (Limassol Half Marathon F50, 1:39:18) and an impressive Paul Freary (Limassol Half Marathon M50, 1:18:50). The After Party by Guaba Beach Bar was the perfect finale to what has undoubtedly been the most successful event weekend yet. The organisers are already looking ahead to the 14th OPAP Limassol Marathon GSO, which has been confirmed as Saturday 14th and Sunday 15th March 2020. Entries for 2020 will open soon. Go to www.limassolmarathon.com for further details. You can also like the Facebook page and follow @RunLimassol #RunLimassol on Twitter and limassolmarathon on Instagram to keep up-to-date with all the latest news about OPAP Limassol Marathon GSO.